All choice has consequence. Even doing nothing has an impact. Everything in our lives is a choice, even doing nothing. At any moment we have hundreds of decision making options, some significant and some seemingly insignificant. We need to become more aware of our decision making process. Too often we operate on automatic, doing things by habit rather than by making conscious decisions. Life is a series of decisions, as we realise this we can slow the process down, recognise that what we are doing is making a conscious decision instead of falling back on habit and past poor decisions. 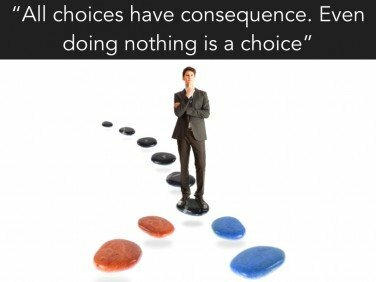 We cannot really abdicate from making choices and decisions in our day to day lives. If we try hand over responsibility of decision to others we are often setting up a situation where we can blame them if things don’t go our way. Acknowledge that the automatic fallback decisions we make in this situation – the habitual choice – would be to act the same way you always have. Then to stop for a moment and choose what you would like to do based on the stronger more successful Self you would like to be. In every moment we can pick a new direction – how to act, how to react, how others’ moods, as well as how these decisions will affect you and how you will affect others. These choices are not made only once but every moment of every day. These decisions mould and sculpt your experiences and actions in the moment and eventually your day and life. When things happen that are not to your liking you can either allow them to bring you down or choose to find the opportunities in them. A reason people make poor decisions and hang onto their negative emotions is that we live largely in a squeaky wheel society. Squeaky wheel syndrome: The person who makes the most fuss or acts out gets more attention.Think of the quiet kids at school who did their work and didn’t get up too much mischief, they seldom got as much attention as those who acted up. The troubled kids got negative attention. In a world where people often get too little quality attention, what with TV and interactive media, for them any attention is better than none. We only have to look at the popularity of “reality” or Jerry Springer type TV shows where people make an absolute fool of themselves for the attention and 30 seconds of fame. The number of people who are willing to degrade themselves like that is amazing. Don’t worry so much about what! Concentrate on how and why! Which path you choose does not matter as much as the decision of how you travel that path and why. If you choose out of fear, guilt, greed (for future reward with less integrity and effort) or to fit in or belong your journey will lack realness and your decision making may result in future guilt. If you choose a path of integrity, love and the desire to know and understand yourself you will reach a depth that will thrill you. Life is about what we choose in the moment. Nobody can choose for us, only we are able to do that. Others can inspire us to choose one path or another just as we can inspire others to choose more beneficial paths. This inspiration is more through deeds and actions rather than just the words. Words can be powerful but words followed by action are incredible in the impact they have together. The consistency of words and actions together is inspirational. Many people think it is best to follow the course of least resistance. This is not necessarily true. Many of our greatest achievements have been made through much trial and error. Think of the hundreds of failed attempts Thomas Edison made on route to a successful light bulb. The thing was that he didn’t give up but he also kept a positive outlook and in his own mind he didn’t fail, each time he succeeded in discovering another way that wouldn’t work. Nothing happens unless you choose to act now. Change happens in the moment, not over time. The effect of what we choose, of the changes we have made, happen over time and we get to choose again and again in the moment. This is what is meant by “live in the NOW”. Too many people live in the past or future, making reactionary choices out of the past. Living chemically and physically out of memories of what happened. When we feel sad and lonely more of the bad experiences come to mind. When we are feeling good more positive experiences come to mind. The choice we make in each moment determines our frame of mind; our frame of mind (and the dominant emotional pictures) determines which experiences stand out.